Gregory Gheraia calls from the newly established brokerage house of Yachting Concept to say that his central agency for sale, the 36.5m motor yacht Midnight Sun II for Milou, has had a major price cut. Built by Italy's ISA yard in 2006, this superyacht is MCA compliant and accommodates 10 guests in a master, two double and two twin cabins. 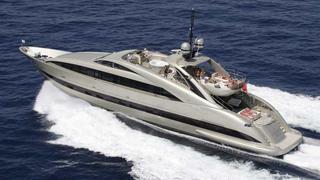 Triple 2000hp MTU engines power her to a maximum speed of 29 knots and a cruising speed of 26 knots. Previously asking €10.5 million, Midnight Sun II of Milou is now on the market at €8.5 million.